I’m sure that each of you will draw slightly different conclusions from this, but here are a few that stood out for me. Second, we need much better monitoring of academic employment, especially at the subject level. The figures from HESA for the HE sector as a whole are potentially indicative, but far from conclusive. If we want to make informed decisions about education and employment, and if we want to ensure that all academics are treated fairly, we need to keep track of the number and quality of jobs in history. I hope that the IHR, HistoryUK, the RHS or the UCU will take this on, because it is not really a job for an individual amateur like me. Perhaps History Lab and History Lab Plus can canvass their members about this and push for it? PhDs obtained: For the 1995-2014 figures, I have used the HESA numbers, which I believe are the most accurate. The IHR also has figures for ‘theses in history’ stretching back much earlier, which I used for the long-term trends, but these seem less consistent and are missing for some recent years, so I have only used them when necessary. Also, Jonathan asked if perhaps there were an increasing number of people doing PhDs who were not aiming for academic jobs (e.g. retirees), thus easing the pressure on the job market. Unfortunately, this doesn’t seem to be the case. If anything, there has been a shift toward more full-time doctoral students in the last decade, though again better monitoring and more systematic investigation might reveal otherwise. A fascinating and very important piece of work – thanks for putting in all this effort and doing such a superb job! However, I think it’s a mistake to assume that all PhD students set out with the sole ambition of obtaining a teaching job in HE, and are disappointed and disillusioned if they don’t get one. That certainly wasn’t the case for me, or for several others in my circle; but then, that was back in the mid-1980s at the height of Thatcherism, when, for example, a current very eminent History professor was scratching a living as a motorbike despatch rider in the West End. In my case, I always knew I’d probably go back into secondary teaching, which provided much more secure and remunerative employment than HE (particularly after I was promoted to deputy head), plus significantly greater academic freedom, e.g. in terms of being able to write what I wanted to write, when I wanted to write it. I know several other History PhDs, both from that era and from the last few years, who always intended to use their qualifications as springboards into other kinds of career. Given that the supply of jobs in HE is very unlikely to improve in the near future (= ever? ), surely the only logical solution to the perceived problem of too many postgraduate students chasing too few HE jobs would be to greatly restrict the numbers allowed to start PhDs – and that would be hugely detrimental to historical research as a whole, and to the wellbeing of the discipline. As you imply, ensuring that postgraduates are completely realistic, open-minded and pragmatic about the job options available to them is a much better strategy. I agree completely and you’re right that I haven’t made that clear here. In my previous post I noted that we should not simply assume that academic jobs for new PhDs are a ‘Good Thing’. We should not neglect the contributions of people with historical training to non-academic fields (e.g. ‘alt-ac’ jobs) and the value of doctoral study to people from all walks of life, irrespective of their career goals. In fact, I hope that this post will push people to think harder about the problem with equating PhDs with academic careers. As your own experience shows, a doctorate can be a ‘springboard’ for all sorts of fulfilling work. His argument that there was ‘pent up demand’ for undergraduate places over the last 50 years might have a bearing on what is happening here i.e. having many more people educated to degree level will in turn increase demand for post-grad study. Having said that, it is also worth trying to compare across disciplines and ask if this is specific to history. Now being in a role where I work with research students across a humanities and social sciences faculty, it is striking how few PhD students some social sciences disciplines now take. People only do Sociology/Criminology/Politics/Languages with research council funding. Economics, on the other hand, has good numbers, probably related to the perceived career advancement a PhD would bring. History seems to attract a mix of motivations: those who want to be academic historians; those who are doing it for the personal challenge; those who do it for career advancement. it is worth highlighting the latter – in heritage, museums and libraries a PhD does aid career development. This is anecdotal though and we clearly need much better data. It would be interesting to have a breakdown for Home/EU/international students, for example. Thanks for adding your thoughts, Will. These posts have focused specifically on history because I wanted to nice, clear numbers. For example, ‘theology’ is included in HESA’s ‘humanities’, but I suspect that it has followed a different trend than history over the last few decades! 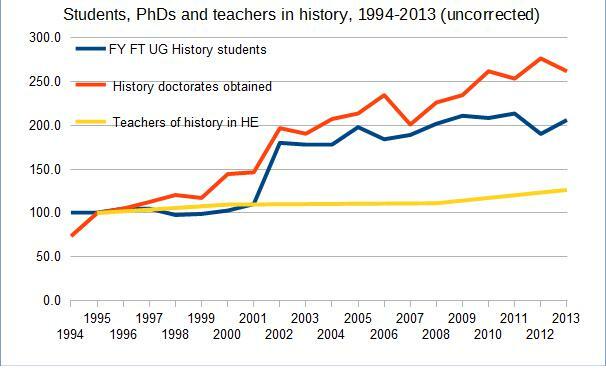 Also, as you say, the range of people who do PhDs in history is probably wider than some other subjects. That said, you’re absolutely right that its a bit parochial to ignore the fact that most of these issues apply to many other subjects and some probably apply to academia as a whole (e.g. casualisation). Historians should not merely lobby for ‘our’ subject: we need to think about what is best for the educational system as a whole. Peter Mandler, who kindly added his own thoughts (below), has been doing great work in looking at the bigger trends. I’m really glad that you’ve taken up the difficult task of coming up with some rough comparative numbers for UGs, PhDs and staff in History. As you say, a complex and probably thankless task! I have done a lot of these calculations for UG numbers over the last 50 years – you can find some very general trends in a paper I recently published in Twentieth Century British History on the fortunes of the humanities over this period [‘The Two Cultures Revisited: The Humanities in British Universities Since 1945’]. As you appreciate, long-term trends at a more granular level are difficult because of changes in coding, etc. 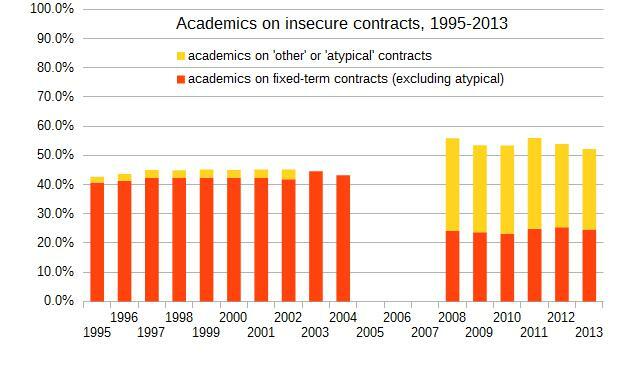 (For example, the jumps you identify in the HEFCE figures from 2002 resulted from new codes that I think they introduced to try to disaggregate ‘mixed/combined’ degrees, which had proliferated since they started counting the former polys. Other jumps depend on whether and when the various counters do begin to count the former polys.) UG numbers in History have probably in fact increased 5x since the mid-’70s, in large part because the polys started to teach more humanities from then, and then in the expansion from the late ’80s *all* institutions were teaching more students of all kinds. We ought to be better at telling that story. Counting staff is almost impossible for the reason you cite – casualization. The indices mostly only count FT staff and GTAs and temporary teaching fellows get left out. You are quite right to emphasize that point. But I’m less enthusiastic about just comparing PhDs to jobs. Not only because of the kind of jobs on offer. But also because there has been a general uprating of educational qualifications and more people are getting Master’s and even PhDs now to qualify for a wider range of jobs – not just academic jobs. That too is a good thing – a more educated workforce. (I’m not too concerned about ‘overeducation’ – are you?) A number of my own PhD students have never expected or wanted academic jobs, but have found very satisfying research and research-related jobs in a range of other disciplines. By focusing on the PhD to academic job ratio, we encourage anxiety among those who do want academic jobs and discount the interests and desires of those who don’t. So I am very keen on general discussions of the kind you have initiated, but less keen on close and regular monitoring of some elusive index, which can easily become a misery index, in which people read the headline and forget all the caveats that you rightly embed. But I do think we need to keep an eagle eye on casualization. The RHS started doing something about this in developing a Code of Practice for temporary teaching staff. We have limited resources but I am sure we can and should do more. Many thanks for your comments. Your ‘Two Cultures’ article is an excellent example of the sort of rigorous and properly contextualised analysis of the history of our disciplines that I think we need much more of. It might help defuse some of the panicked hang-wringing about ‘crisis’ that we’ve heard so much of lately. Regarding the issue of comparing PhDs to jobs, I can certainly understand your worries about inadvertently creating a ‘misery index’ that might simply dissuade people from pursuing higher studies in history rather than inspiring constructive reforms. That’s an aspect I hadn’t thought about. However, as you’ll see from my latest post, I do still think we need to track these numbers or we risk burying our heads in the sand. It is, to my mind, better to have some hard data than endless anecdotes and rumors swirling around. If the RHS (understandably) doesn’t want to publish a simple index of PhD/jobs that is perfectly reasonable, but it still would strengthen the profession for the RHS (and/or IHR) to track such figures systematically, so that we as historians can make informed decisions about our careers and about the discipline as a whole. Perhaps what might work best is if the RHS had a single page that set out clearly the most plausible post-PhD career routes, in which academia was treated as one of several rather than the ‘norm’ with alternatives only briefly alluded to. I hope that I may be allowed to make a point at a tangent to the main lines of this discussion. 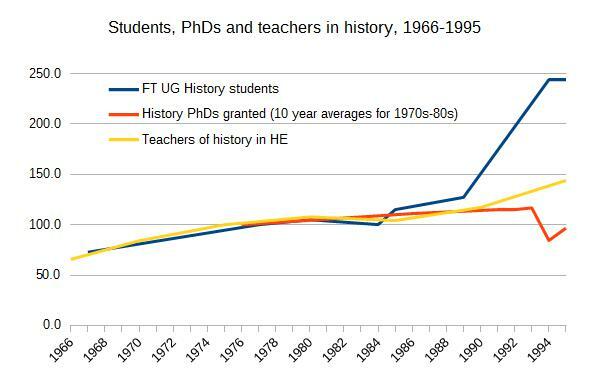 The figures for students studying for undergraduate degrees in history, for those gaining Masters or Doctoral degrees, and for staff, whether employed full or part-time, are of great interest and importance. I have no doubt at all about the utility of degrees in history for entry into other professions. However, I am also concerned about those who, for one reason or another, are committed to the discipline but find themselves unable to pursue their studies after finishing their first degrees or are forced to abandon postgraduate degrees before they can complete them. This is a constituency that ought to attract much greater attention. If history’s place in higher education in this country is left to accountants and administrators as well as politicians, I fear for it. The means to help this wider group are to hand via the internet, audio and video conferences and recordings, on-line academic journals and databases, MOOCS or free universities or institutes. It is one thing to analyse what has been happening over recent decades but better still to tackle the problem I have outlined in a new and more far-reaching way. Yes, making historical study and research more accessible to those who miss out on a postgraduate degree (or an academic position) ought to be a key goal moving forward. I think this would be a good unto itself (a more historically knowledgeable society is a better society) and perhaps it make the problems of funding and jobs less acute if the research resources available to those outside universities were equal to those enjoyed by insiders. I have raised the issue of the loss of people deeply interested in the discipline of history but obliged by circumstances to lose contact with the subject after completing their undergraduate or postgraduate degrees on my blog and in comments in other places on a number of occasions. To my regret, I have not really succeeded in starting a wide-ranging debate although most academic historians recognise the importance of this haemorrhaging process and agree that something ought to be done. The fundamental question is what can or should happen to maintain links with such people. If contacts are to be maintained with those who wish to sustain their interest in history after leaving universities, there must be mechanisms in place to facilitate this process. In other words, there should be forums for discussion, links to academic databases and networks of historians covering university departments and those beyond employees and students. I have been giving some thought to how this problem may be tackled whilst trying hard not to be too prescriptive. The first idea that has come to mind is to utilise the resources of the web to provide an overarching site linking these two groups. It is perfectly possible to find blogs that provide news, comments, lists of events, etc., and websites that provide details of forthcoming conferences and seminars, of prospective publications, reviews of recently published books. Other sites reproduce audio and video recordings of lectures and seminars. There are other places where one can find downloadable copies of published documents and of older books. Some academic journals offer temporary access to articles in their contemporary editions or to older articles after a certain laps of time. It is not as though historians generally are short of material to exploit as a random search of Twitter will show. These are preliminary suggestions of mine. It might also be possible to seek volunteers amongst academic historians willing to help independent historians secure copies of articles that the latter cannot gain access to directly. Others will certainly have further and better ideas. I am strongly tempted to try to create such a site. If anybody is interested in helping me, please contact me. That sounds like an excellent idea to me, Christopher. It would be great if there was a central site that included all of that. Unfortunately, I suspect that creating and maintaining such a comprehensive site would be close to a full-time job! In the meantime, your own site already covers some of this, and Sharon Howard’s suit of sites is excellent for early modern blogs and online resources (http://sharonhoward.org/earlymodern.html). I appreciate the effort you put into the data and find the topic interesting. One thing that strikes me in discussing the relationship between PhDs and academic positions is that not all history doctorates are the same. The likelihood of graduate students becoming faculty varies depending on the region and time period of study. I made a very amateurish analysis of the field of Canadian History (http://activehistory.ca/2015/08/is-pre-confederation-history-actually-declining-a-response-to-thomas-peace-and-robert-englebert/) and noticed that approximately 1 in 10 doctoral students studied the period before 1867 but 1 in 4 faculty did so. The job markets are radically different for experts on the two periods and I would expect that similar trends hold in other countries. If PhDs, undergraduates and faculty are going to be systematically measured, it is probably worth tracking a few subdivisions in the field. Thank you for the link to your analysis of the Canadian situation. The subfield level numbers are very interesting and, as you say, they don’t all move in the same direction. 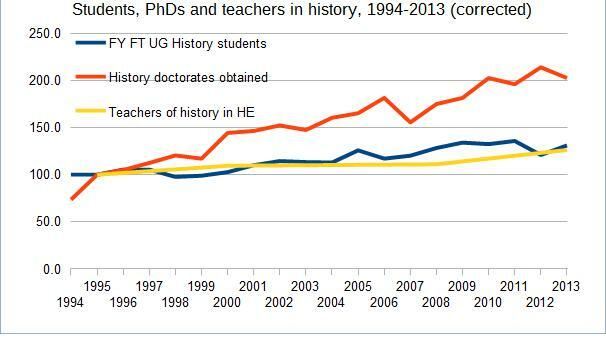 There is some IHR data on subfields for British PhDs, but it is very messy. Rachel Stone attempted to look at the data for medieval history (https://manyheadedmonster.wordpress.com/2015/09/02/the-job-market-for-historians-some-data-1995-2014/comment-page-1/#comment-4221) and I’m sure with enough patience further analysis of this type could be done. I suppose the only question is the utility of such numbers: how could they be used to move us towards a stronger and more equitable historical community? If the subfield numbers could be easily collected, they would make a useful contribution to the two of the suggestions you have recently made for using this data to strengthen the profession. They would be particularly useful to describe the profession to incoming PhD students. Presenting the overall relationship between Phds granted and teaching positions would make some decide against further study and others to be more serious throughout the program about preparing for non-academic employment. Presenting the subfield numbers would have a greater influence in those fields with a higher ratio of new phds to teaching positions. You also suggested that faculty should contribute to non-academic outcomes and programs might look at creating internships. The psychological effect on faculty of seeing particularly bleak prospects for students in their subfields would make them more motivated to make those changes. If I may come in on this: I’d be really interested to hear what you think it would be useful for the RHS to try to COUNT, and I’d also be interested to hear what kind of advice, information or anything else we should be providing about these issues. There are probably other things we could usefully do. I’d be really interested to hear your thoughts about what you’d like to see the RHS doing. And in the meantime, thanks for your efforts to add some data to the sometimes rather frustrating debate that’s been swirling on twitter about the fate of ECRs in History since Matt Lyon’s article in HT! Thanks for your encouragement, Adam. I’ve tried to set out in my new post exactly what I think we should be counting. As I said to Peter, we already have plenty of anecdotes and I suspect some of these figures will end up floating around anyway, so it would be better for the RHS to provide a central and ‘official’ place for them to be available, which could then also provide practical advice to new PhDs.